Pancakes are a form of Quick Bread cooked on top of the stove, usually in a frying pan. North American Pancakes are big, but risen and fluffy inside. They are risen either with yeast or, more usually, baking powder or baking soda. Germans make Pancakes by pouring all the batter into a cast-iron frying pan, and baking them for about 1/2 an hour. Usually fruit such as sliced apple is put in the pan first. You slice up the pancake as you would a cake or pie and divvy it out. 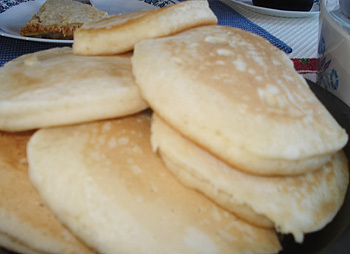 Pancakes are the most common use for buckwheat flour in North America. Aunt Jemima pancake flour was not only the first pancake mix; it was quite possibly the first industrially-produced, ready-mix food to be sold commercially (well, at least since Roman times.) Two men, named Chris L. Rutt and Charles G. Underwood, who owned the Pearl Milling Company in St Joseph, Missouri, came up with the idea of a pancake flour in 1889. Underwood did most of the product development, at his brother’s farm in Good Intent, Kansas, just west of Atchison. Rutt came up with the name; he had recently been to a musical, a song from which had stuck in his head: “Aunt Jemima.” A year later, they sold the rights to the product to the R.T. Davis Milling Company. A few years later, R.T. Davis hired a black woman named Nancy Green from Chicago to represent the product at the 1893 Columbian Exposition in Chicago. Nancy Green was a natural; police had to come to manage the crowds at her booth, and the fair officials gave her a medal. R.T. Davis signed her up for a lifetime contract. Nancy Green represented the product until she was killed in a car accident in September 1923. Quaker Oats bought the product in 1925. To test if a pan is hot enough to start cooking Pancakes, flick a drop of water on the pan. When hot enough, the water will sizzle and disappear in a flash. Too much butter or oil in the pan is what usually makes the first pancake a flop. It sops up all the excess, gets tossed in the garbage, then the others come out fine. If you’ve melted too much butter, push it away with a flipper or mop it up with the edge of a piece of paper towel. When bubbles appear on the pancake, and just start to break, it is time to flip. Don’t wait and let any more break, as you want air to stay in the Pancakes to keep them fluffy. The side that gets fried first is the side that will look the best, and therefore the side that you will want to present. Freeze Pancakes with a layer of plastic wrap between them. Flat, thin Pancakes such as the French make — crèpes — have always been made. The Pharaohs made them; the Romans ate them with honey mixed with pepper. It was the American colonists, though, who leavened their Pancakes to make them rise. Buckwheat Pancakes were particularly popular with the colonists.